Twelve disabled veterans, sponsored by Disabled Sports USA, finished Oregon’s world-renowned relay race. A team of 12 disabled veterans, including wounded warriors who were severely injured during the conflicts in Iraq and Afghanistan, competed in Oregon’s iconic Hood to Coast Relay race on August 23 and August 24, finishing 117th out of 1,006 teams in the race. 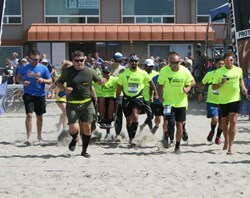 Team Warfighter Sports was the only team of wounded warriors to participate in Hood to Coast. This year’s team included wounded warriors with a wide range of disabilities including amputation, spinal cord injury, nerve and muscle damage, visual impairment and traumatic brain injury. The team was sponsored by Disabled Sports USA (DSUSA). In an inspiring feat of resilience and courage, the team took on the world-famous, 195 mile Hood to Coast Relay. Equipped with the latest technology and the support of their teammates, Team Warfighter Sports competed against more than 12,000 other runners in a grueling race with an impressive finish time of 26:18:64. “It was absolute humbling experience to see people from all over the world share a common interest: running. It was even more exciting to see how our group came together to compete at this type of event,” said 28-year-old Joseph Frank, U.S. Navy Petty Officer Second Class, who has a traumatic brain injury and orthopedic injuries and is a resident of San Diego, Calif.
Disabled Sports USA’s Warfighter Sports program offers sports rehabilitation for severely wounded warriors in military hospitals and communities across the U.S. through a nationwide network of over 100 community-based chapters. Contributions cover all expenses for participation, including individualized adaptive instruction, adaptive sports equipment, transportation, lodging and meals for the warrior and a family member. Since 2003, more than 7,000 of the most severely wounded and their families have been served, including those with amputations, traumatic brain injury, spinal cord injury, visual impairments, and significant nerve and muscle damage. For more information, visit http://www.warfightersports.org.